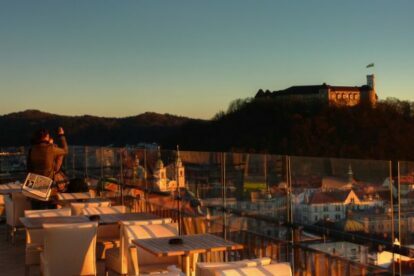 This is a unique experience in Ljubljana: drinking coffee on the terrace, 50 meters above the streets, in the first skyscraper in this part of Europe. The café on the top of Nebotičnik finally reopened its doors in 2010. It was the center of the social life in the past. Each person has its own memory of the place. Older ones think about all that jazz on the top at nights, while younger ones still fancy a strawberry juice with whipped cream. Sadly the place shut down in late 90’s and we almost forgot that this existed in Ljubljana. I remember the first time I went for a coffee after the renovation. It was cloudy and somewhere in the middle it started to rain, but I didn’t care. The view from the top is spectacular!